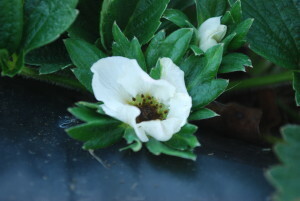 We removed the row covers from the strawberries planted last September, and they are blooming like mad. I just love this time of year! Dreams of life and growth and possibility spring forth into verdant reality. Look at the transformation! Here are the freshly-planted strawberry beds covered in plastic. Next to them are the blueberries and you see six empty beds awaiting their inhabitants. This photo was taken last September. The strawberries and blueberries have been joined by blackberries and three varieties of raspberries. We need to prepare two new beds for the little blueberry bushes Angie’s parents dug for us. We’ve also added fruit trees, nut trees, elderberry shrubs, and grape vines to the food forest. The garden is covered in its black plastic sheet and we transplanted more than 60 broccoli seedlings from their former home under the grow lights. The girls helped Angie plant a long row of snow peas in the garden and two planter pots full of spinach on the back deck. There are tomatoes, peppers, and other vegetable seedlings growing root and stem in their Solo cups lining sunny window sills. They will be ready to transplant into the garden after our average frost free date in May. 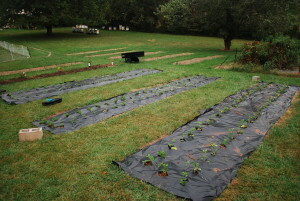 As the soil warms up, we’ll start seeding squash, melons, cucumbers, and green beans into the ground. I can feel the joyful photosynthesis in leaves turned toward the sun. I can hear the plants digging deep roots to draw nutrients from the soil. The worms and ants and their soil-building community are going to work and the chickens are feeling the effect of lengthening days as their egg laying increases and they think about raising broods of chicks. Life is all around us, and it is beautiful.